The hypothalamus is a brain part at the base of the brain. It connects the endocrine system to the nervous system. 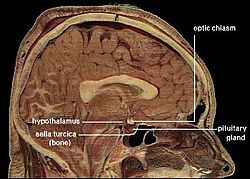 The word hypothalamus is a Greek word which means "under the thalamus"; it is used because hypothalamus is below the thalamus, and above the brain stem. The hypothalamus controls body temperature, hunger, thirst and circadian cycles. It is the control system which regulates the pituitary gland, the 'master gland' of the body. The thalamus sits above the hypothalamus, and the hypothalamus sits above the pituitary gland. That area at the base of the brain down to the pituitary is the centre of neurosecretion. Some neurosecretory cells of the hypothalamus produce hormones such as oxytocin and vasopressin. These hormones are released into the blood in the posterior pituitary. It is the main way the nervous system controls the hormones in our bodies. 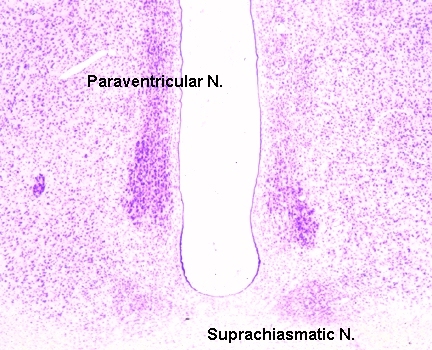 A cross section of the monkey hypothalamus displays 2 of the major hypothalamic nuclei on either side of the fluid-filled 3rd ventricle. Hypothalamus Facts for Kids. Kiddle Encyclopedia.